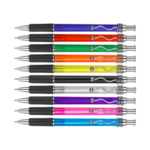 Frosted branded pens differ to those made from a solid plastic material and let you see some of the mechanical workings inside the pen. 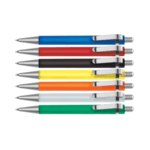 This can add another dimension to the pen and also opens up colour combinations that can be interesting for your promotional campaign. 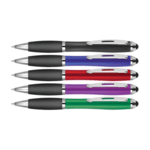 Frost promotional pens are made from a plastic to which an additive has been added during the plastic manufacturing process which introduces a frosted and matt look to the finished material. 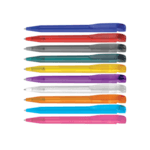 We supply thousands of printed frosted pens and a wide variety of colours with matching or contrasting barrels, clips and trims. Let us know if you need a colour matching service or want to see examples of pens supplied for previous campaigns. 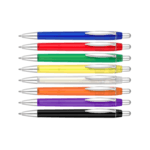 Plastic Pens are one of the most popular promotional giveaway as they are relatively inexpensive and come in wide variety of colours. Plastics are made from naturally occurring materials like cellulose, coal, natural gas and crude oil through process known as polymerisation which is a chemical process that links ethylene and propylene together into longer polymer chains which are solid when cooled. Colours are added to the plastic mixture during the process and the plastic is moulded into shape to form the part of the pen it will be such as a barrel or pen top, nib, clip or button. Another term of plastic is acrylic and plastics can either be solid colours or frosted. 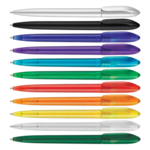 Frosted pen plastic allows light to pass through a matte finish product. The plastic reduces reflected light and with lightly coloured frosted plastics it is normal to be able to see the inside of the working pen in terms of the mechanism, spring and ink cartridge or pipe. 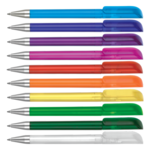 When you choose a plastic pen with a frosted finish you have as wide a choice of colours and options as a solid plastic one. You can choose to have matching or contrasting barrels and pen tops. One thing to take care with is that you choose a frosted colour that will be in contrast to your logo colours so that the imprint is visible and stands out. It is also important to make sure that any text is large enough to be read and to avoid any ink fill of the space within the letters during the printing stage. 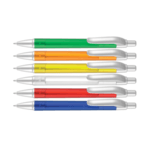 We have supplied hundreds of thousands of plastic pens over the years and can supply examples of ones used for previous marketing clients and their campaigns. Please let us know if you need a sample. We can also produce one-off print run samples (at a cost) or alternatively a free of charge virtual visual whereby our Design Studio can place your logo onto a pen and send you a digital file showing how the logo looks. If you cannot find the pen you need we can probably source this or a good alternative through our supply chain. Where the manufacturing run is big enough we can also look to produce a bespoke or custom pen for your campaign. The costs for this can be higher due to the tooling required and to get the unit price down the overall manufacturing run needs to be significantly large. How are your frosted pens packed for distribution? The most common form of packing is a cardboard box. The printed pens are placed in a polythene bag and then this is placed inside the cardboard box which itself is non-branded. If you need to know the approximate number of pens per box this may be shown on a specific product specification page or please contact us for more information and we will find out the information from our production team. Can you print more than one colour in the imprint? We can print single or multiple colours in an imprint using screen or digitally print technologies. It is important to choose a frosted pen barrel colour that will provide a good contrast to your logo imprint and its colours. Does a frosted pen provide a good background for an imprint? 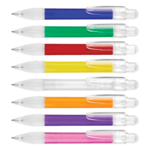 As with any plastic product the best colour for a frosted pen is one that will provide a contrast background for your corporate logo.